In the company's conception, they built things with the goal of being user friendly and making the users life easier. This seemingly stopped with the passing of Steve Jobs. Since then, Apple has seemingly changed its focus more on the investors and businessmen and less on the people using their products. They've removed the most basic of things from their products (like the headphone jack) so they can sell you more stuff for a price that is equal to some people's rent. If that and their weird feud with the JPEG image format didn't turn you off modern Apple, their stance on product repair may be the final nail in the coffin. 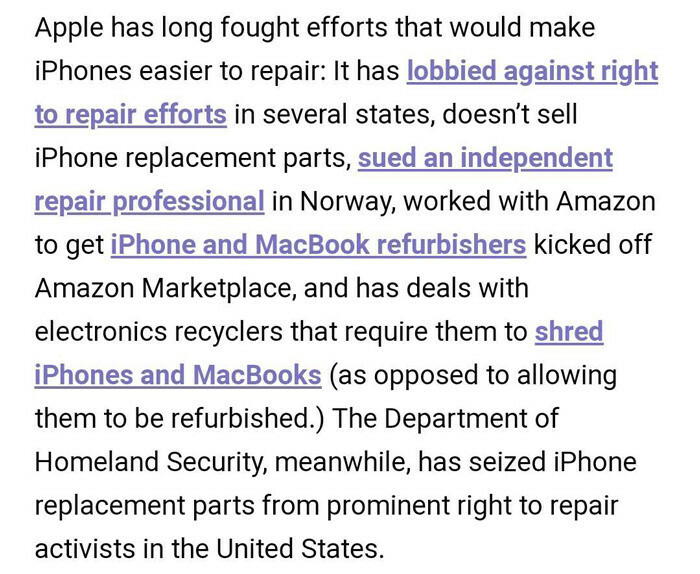 This outrage with Apples policy began with a tweet by Twitter user @The_Maintainers. A letter from Apple CEO Tim Cook. Understandably, people had some opinions. Agreed. Especially their newer stuff. ... and if they're not impossible to fix, they're expensive to fix. They're not getting any more of mine for so many reasons. Having an ios device is not the problem. 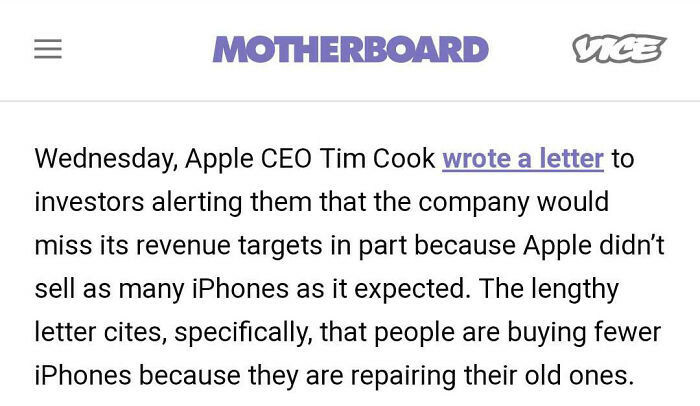 Replacing an ios device with another one after complaining is the real issue. Don't replace your ios devices with a new one. Don't be part of the problem. Greed will ruin their business first. That's when they lost my business. Apple's recent business model is all about them benefitting with no consideration for their loyal customers. It is yet to be seen how this policy will impact Apple going forward. Their previously highly criticised decisions have had little impact but this may be one restricting decision too many.